The majority of the services we offer are handled in-house, plus, self storage is more than 95% of our business. We also pride ourselves on quality and meeting deadlines. Engineering? We’ve got it covered. Technical Drawings? Design? Compass is the source to draw on. Project Assistance? Construction? Let us build your trust. We’re the one-stop self storage building supplier. 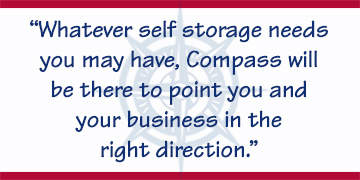 In fact, whatever self storage needs you may have, Compass will be there for you. We’ll point you and your business in the right direction to help meet your demands, as well as the demands of your customers. The bottom line is if it’s related to self storage, chances are we do it, and do it well.